How to Buy Ripple (XRP) ? Buying XRP is very easy these days. If you want, you can use cash, card – even PayPal! However, you still need to follow a few steps to do it – that’s why we made this easy tutorial for you! It is separated into parts – just follow the one that matches your purchase method. How to Buy XRP with Credit Card or Debit Card? No matter what people say, it’s easy to buy XRP with a credit card. Your first step will always be buying Bitcoins or Ethereum with your credit card. They can then be converted to XRP. Transfer Bitcoin or Etherium to an exchange that supports XRP currency. Finally, exchange Bitcoin or Etherium to XRP. Please follow our step by step guide bellow to buy XRP. 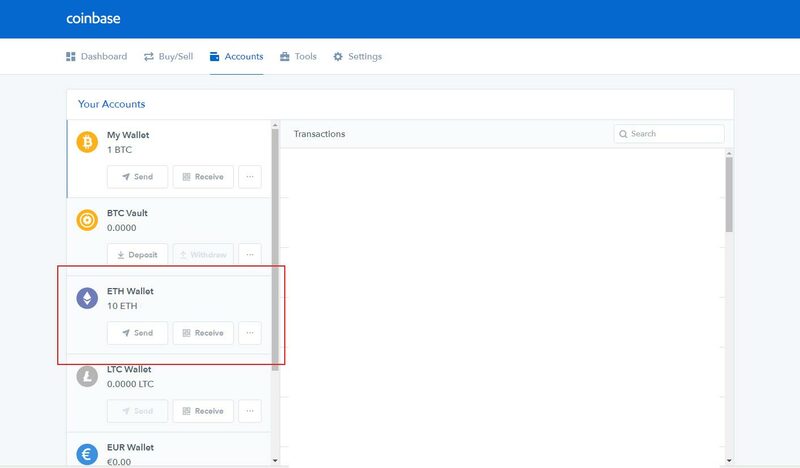 To buy Ethereum from Coinbase – which you will exchange for XRP (XRP) later – you have to create an account at Coinbase. Click this link here to create an account . As we mentioned, you need to exchange your Etherium to XRP. In our tutorial, we’re going to use Binance as the website to exchange Ethereum for XRP. 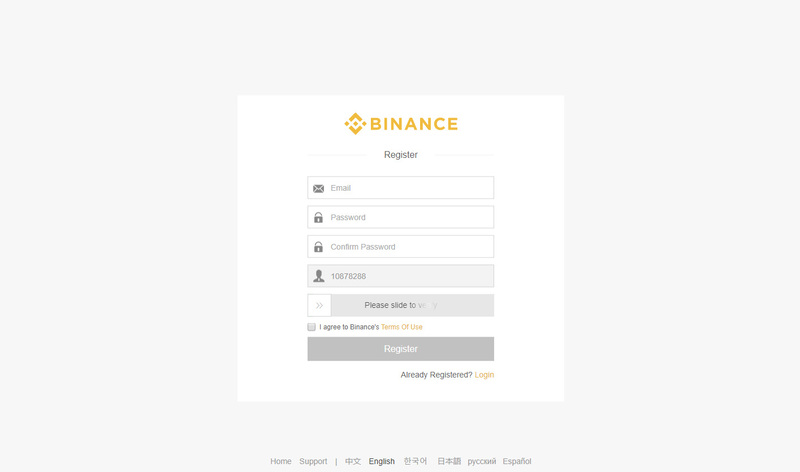 Click this link to go to Binance, then click ‘Register’ on the top right. An email will be sent to confirm your email address. Click the link in the email to proceed. 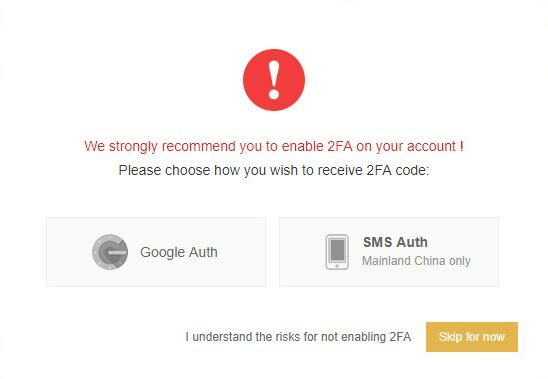 A pop-up will show up to advise you to set up 2FA – two-factor authentication – on your account. Do this to protect your money – even if a hacker gets your Binance password, the second level of verification will almost certainly prevent him from getting into your account. Our recommendation is to use Authy app available on your smartphone or web browser. Hover the mouse cursor over ‘FUNDS’ on the top menu, then click ‘Deposits’. The new screen will show how many coins you have stored on Binance – currently, you have none. Type ‘Ethereum’ in the search box. Find Ethereum in this list. You will be given a long string of numbers and letters – this is your Ethereum deposit address. Copy this address and save it/write it down somewhere safe. You’re going to need it soon. Note: Make sure that you really selected Ethereum (ETH) – sending your coins to the wrong wallet will destroy them. if you send your coins to the wrong wallet you will lose them. Get back to Coinbase. If you followed our advice, it should still be open. Click ‘Accounts’ from the top menu bar and find your Ethereum wallet on the left. 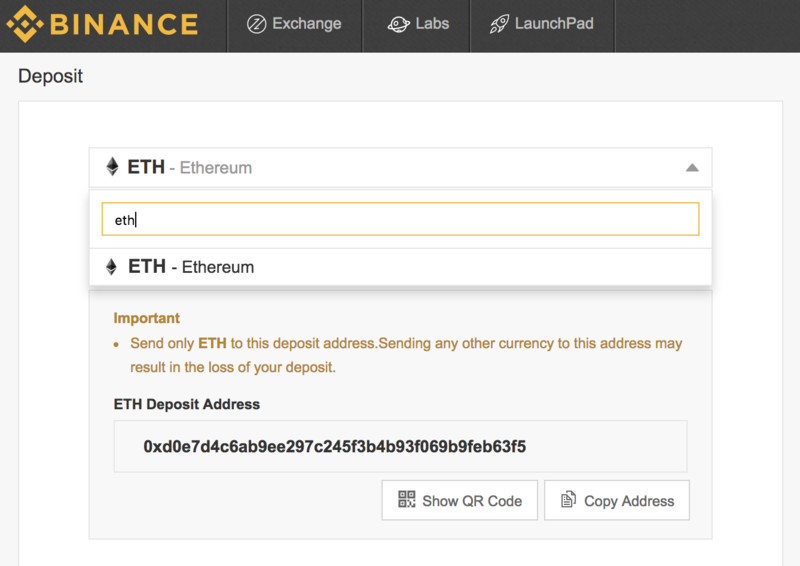 Paste/write in the Ethereum wallet address from Binance into the ‘Recipient’ box. In amount box, type in the amount of Ethereum you want to transfer (if you want to send it all, use the ‘use max’ option). Coinbase can ask your for a confirmiation via password/phone. Follow the instructions and Coinbase will confirm that the Ethereum coins are sent. You will have to wait for a few minutes for the Ethereum coins to be move to Binance. Usually, it takes between 20 and 60 minutes for coins to appear in your Binance wallet. This depends on network load and it might take longer during busy times. Don’t panic. 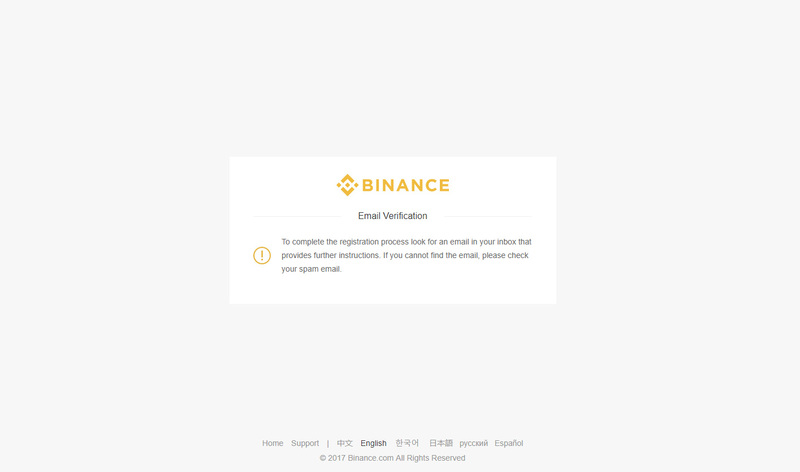 Binance will update automatically – you don’t need to refresh the page. Once the Ethereum shows up in your ‘available balance’ on Binance, you are read to exchange/trade it for XRP. Click this link to go straight to straight to the XRP/ETH exchange on Binance. Do not be alarmed! Not everything on the exchange page is important to us. We are only going to use a small part of it. ‘Limit’ order: you can set the price at which you want to buy XRP yourself. ‘Market’ buy: fills out your order at the best price available automatically. Market buy is more simple, so we are going to use that. Find the big green ‘Buy XRP’ button. 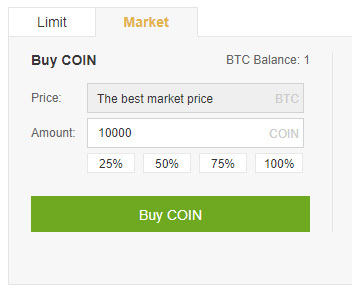 Click the ‘Market’ option in the window above the button. Fill in the amount of XRP you want to buy into the input box labeled ‘Amount.’ You can use the percentage buttons under the box to make the process easier. For example, if you want to trade 50% of your Ethereum for XRP, click the 50% button. Once you have entered the amount you want in the box, press the buy button. Your order will be carried out immediately. You should now click ‘Funds‘ in the menu bar on the top, then go to ‘Balances’. Type XRP in the search box. This will display the amount of XRP in you now have in your XRP Binance wallet. You can now leave your coins on Binance, where they should be reasonably safe. However, exchange site hacks happen and people get robbed of their money. We recommend keeping your coins in a personal wallet. Can I Buy XRP With PayPal? You cannot directly buy XRP with PayPal at this time. 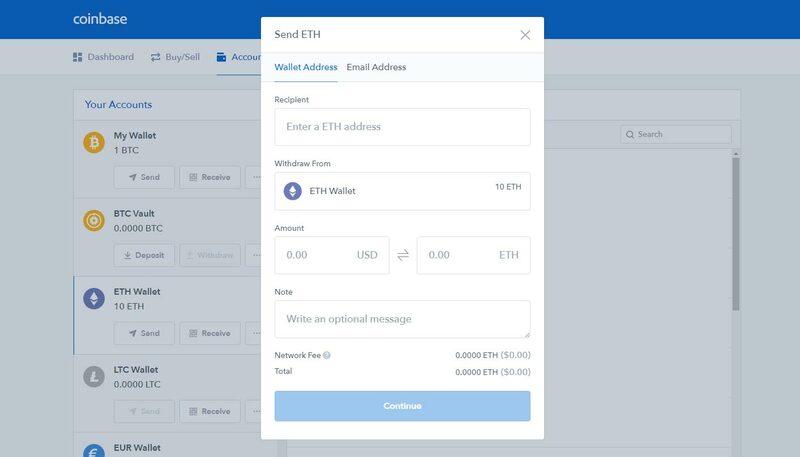 If you wish to use PayPal, you will have to buy bitcoin first and then exchange bitcoins for XRP by using a service like Binance. Can I Buy XRP With Cash? You cannot directly buy XRP with cash. Even if some ATMs support XRP, they are less than 1% of all cryptocurrency ATMs. If you want to buy with cash, you will have to buy bitcoin first and then exchange bitcoins for XRP using a service like Binance. Can I Buy XRP With Bitcoin? Yes, you can do that easily by using Binance to exchange bitcoins for XRP. Europeans can use BitPanda to buy bitcoins or ethereum with Skrill. Ethereum or BTC can then be converted into XRP on Binance. Yes, you can do that easily by using Binance to exchange Ethereum for XRP. The cheapest way to do it is to buy bitcoins with bank account (or XRP directly with bank account) and exchange the BTC for XRP. The fastest way is to buy XRP with a credit card, but you will be charged higher fees. How Can I Protect XRP Once I Purchase It? You should store your XRP in a secure wallet. Leaving XRP on an exchange just puts you at risk of losing money if the exchange gets hacked. Your account could also get hacked, which is why it’s important to use 2FA. How Can I Sell XRP (XRP)? Binance and Changelly are good places to exchange your XRP to any other cryptocurrency. If you want to exchange it to regular currency, trader XRP for bitcoin and exchange BTC into dollars, euro, or other currencies. Can I Mine XRP Instead Of Buying It? You cannot mine XRP as it has a different network structure than Bitcoin. You can only purchase XRP from an exchange.